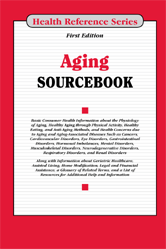 Aging Sourcebook, First Edition provides information about physiology of aging, impact of stress on aging, and how the brain's health can make a difference. It also discusses about healthy aging through physical activities, healthy food habits, and immunizations. The book provides information on aging-associated diseases and medical conditions such as cardiovascular disorders, eye disorders, instability, mental disorders, musculoskeletal disorders, neurodegenerative disorders, respiratory disorders, and more. Section 1.2—Genetics: Is Aging in Our Genes? Section 1.3—Metabolism: Does Stress Really Shorten Your Life? Section 1.4—Immune System: Can Your Immune System Still Defend as You Age? Section 4.2—Brain Health: You Can Make a Difference! Chapter 5—Can You Lengthen Your Life? Chapter 33—Online Health Information: Is It Reliable? Section 35.4—Stay Safe in Cold Weather!